Want to stay active and spare your body while at work? 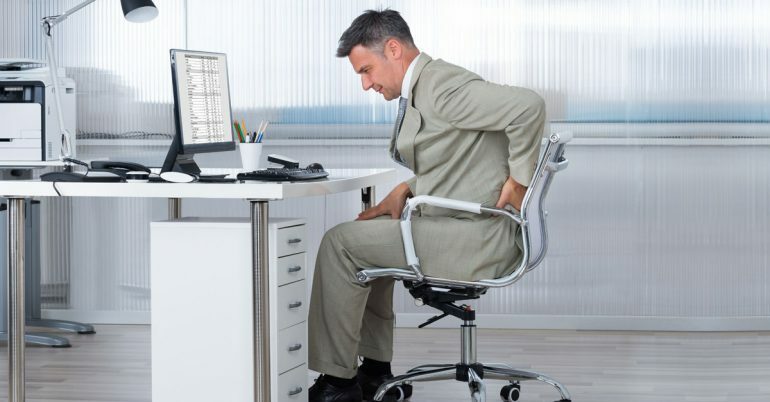 Here are some tips to follow to minimize the harm due to prolonged sitting. How much do you think you sit on a given day? No, seriously: think about it. Sit at breakfast, sit in the car, sit at work, sit at the computer, sit during lunch, sit in meetings, sit in the car again, sit at dinner, sit while staring at your phone, sit in front of the tv – you got the point a while ago! Apart from sleeping, our bodies are meant to move. Movement is how we interact with our environment – it helps us communicate, connect, and build relationships with others. The way to address the issues of inactivity is – you guessed it – sit less and move more! from the book, “Deskbound,” it’s recommended you move around for at least two minutes for every 30 minutes you are deskbound. Set an alarm on your phone to remind you to get up. Take micro-breaks to at least stand and stretch. Drink more water (hydration is healthy, and it forces you to get up and go to the restroom more often!). If you don’t move well or move often, it may be a sign you are not as healthy as you believe to be or could be! No matter what we do, we will subject our bodies to undesirable stress where our bodies will adapt. To mitigate the inevitable stress the modern lifestyle places on our bodies, it’s important to get in the habit of performing general maintenance on a daily basis. The daily practice may seem difficult to keep up at first, but much like brushing your teeth is a daily habit you would rarely, if at all, skip, it will become a ritual. We all know the benefits of regular stretching but rarely do it or keep up on it. Why so? – likely because we do things like mindlessly bend over to stretch our hamstrings expecting our back pain to go away. With mindfulness of what we’re trying to accomplish, we should perform general maintenance like stretching, foam rolling, self-mobilizations of muscles and joints, combined with the proper awareness of postural positions, and body mechanics. When we accept and commit to maintenance as a practice rather than waving a magic wand, we’re likely to achieve the solution we’re seeking. The practice of general maintenance should and will take some time to custom-tailor to your needs. To keep it simple, the rule of thumb is to conform your workspace to you as opposed to conforming to your workspace. If you’re forced to sit at your desk, an excellent strategy to combat the effects of sitting – further than making a valiant effort to take micro-breaks throughout the day – is to kneel on one knee. Kneel on one knee with the other leg in front of you with knee bent and foot flat on the ground. Now, you’ll need some cushioning for your knees like a folded bath towel or a pillow, and may need to adjust the height of your kneeling knee by placing an object like a textbook underneath. The half-kneel position puts you in a neutral, low back and pelvis position organically, without having to think about it or be taught how to do it. I’m a big proponent of sharing quality material to empower anyone motivated to take responsibility for their health. However, if you’re suffering from chronic pain or a severe injury, don’t hesitate: seek the help of qualified health/medical professional, if you haven’t done so already. A professional will be able to not only help you get a grasp of your ailment but also help you to understand the underlying cause and how to take control of it! RJ Burr practices at REACH Rehab + Chiropractic Performance Center in Plymouth. He works according to his belief - for you to have a healthy, pain-free lifestyle, you must be responsible for your health by eating well, moving well, and moving often. 2. ↑ Laura Chaddock, Michelle W. Voss, and Arthur F. Kramer, “Physical Activity and Fitness Effects on Cognition and Brain Health in Children and Older Adults,” Kinesiology Review 1, no. 1 (2012): 37-45.